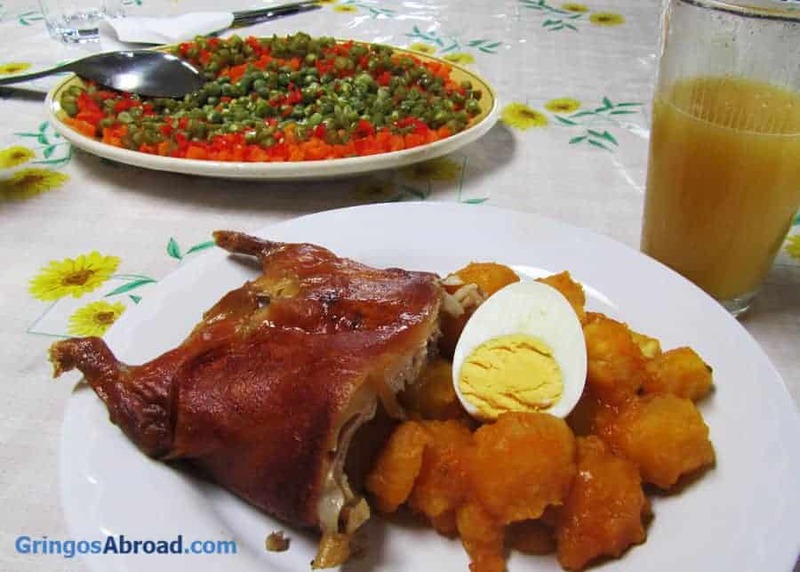 Cuy is a traditional dish – a delicacy – in Ecuador. And yes, cuy are guinea pigs. In this post, I share my experience visiting a cuy farm and eating fresh roasted cuy. I also share my thoughts on adapting to new cultures. Culture. What’s the first thing you think of when you hear that word? Perhaps your first thought is of your culture, whatever that might be. Or maybe you think of something you saw on the television about different and exotic locations. Whatever it might be, every country has its own story and its own culture. Some are relatively soft which makes it easy to adapt to them. Others may appear strange to us and difficult for us to adjust to them. There may be some stark differences between our culture and the one we may be trying to adapt to – whether that be their music, people, or food. In this post, we will talk about one of the culinary features of Ecuador. The specific delicacy that we had was made for us by a friend that owns his own business that specializes in this particular dish. Before I keep telling you this story, I’d like to clear some things up. A lot of people think of ‘developing’ or ‘third-world’ countries as poor, filthy, and uneducated. Of course, there are areas that are not beautiful and polished, but that can be said of anywhere in the world. Every town, city, and country has it’s poor and unkempt areas. But Ecuador is wonderful and beautiful. Some foreigners think that just because someone can’t speak their language, that somehow makes them unintelligent. This is obviously not my opinion; I find the idea offensive; after all, we are the ones that can’t speak the language of the country. If anything, we’re the dumb ones for not learning their language. We are in their country. We need to adapt to, and respect, their culture. We can surely imagine how bad it would feel if someone came to our country and treated us all like idiots: making fun of our culture, our food, or the way we talk. And when we don’t understand something they just yell it louder at us in their language (as if that would help). Believe it or not, I have witnessed foreigners doing these things to the people in Ecuador. So please remember that these people are the same as us, and have much to teach us about the importance that family and spirituality should have in our lives. Getting back to my story, my friends had a barn behind their house. And (drumroll… 🙂 ), the barn was filled with guinea pigs! They were very healthy and well cared for. Like any animal stable, I was expecting a rather unpleasant smell. But his barn didn’t have much of a bad odor at all. Instead, it has a rather pleasant smell of alfalfa and hay. There are large pens for the guinea pigs, where they seemed quite happy. The pregnant ones are about as big as footballs! When guinea pigs get frightened, they make a chirping noise and huddle together in big groups. They are adorable. Now, you might be thinking that I’m a monster – looking at these cute, defenceless animals and then having them killed in cold blood. I find it amusing that people can look at chicks and calves and find them sweet and then eat chicken nuggets or a burger with no problem whatsoever, but think that guinea pigs are somehow an exception. They are just like any other farm animal: raised for meat in clean conditions and killed humanely. How to eat cuy: In most restaurants, you’ll be given a spoon to eat your meal. You’ll want to use this for the rice, potatoes and salad. To properly eat a cuy, you’re going to get dirty. Just pick it up and dig in. Think KFC: Cuy – it’s finger lickin’ good! The cuy is not a very meaty animal, so you’ll need to pick it up to easily eat the meat. After they gave us a tour of their property, including the house, barn, and alfalfa fields, it was time for lunch. I love animals and don’t think I could have watched them kill or clean the guinea pigs, so they already had them prepped and ready. A guinea pig is cooked whole on a spit with a metal pole through their middle over hot coals. They are then brushed with butter and spices to make them taste amazing! I’m not a fanatic; I do find that they look a bit gross while they’re being cooked. However, they taste AMAZING! That’s right… I ate a guinea pig. Multiple guinea pigs, actually. The guinea pig is a bit like Ecuador’s version of lobster, served whole with a few side dishes. A guinea pig is served with amazing potatoes that have a delicious mayonnaise sauce, avocado, and tomato or pico de gallo. If someone offers you guinea pig and you don’t think you can try it, do your absolute best to be kind and respectful to your host because guinea pig is a real delicacy and very expensive by local standards, so it means that your friends think a lot of you. However, I strongly suggest trying it! The meal was amazing, and we had some good laughs with our friends. Something to remember while traveling abroad is that while most people do have high hygiene standards, some don’t. Just like anywhere else, there are restaurants with good reputations and restaurants with bad reputations. So ask around before you try your first guinea pig to make sure you get the best experience. Also, just use common sense. This is not an insult to your intelligence; some people become naive while traveling and do things that they never would normally. Make sure people are always coming and going from the restaurant, so you know their food is fresh. Something to be aware of is that while a lot of the guinea pigs are killed how we might consider ‘normal,’ some are ended by bashing their heads against a rock (I know, it’s sad and hard to imagine, but it is how the custom has developed for generations). This means that there is an unusual amount of blood in the meat. A lot of people think that it tastes better blood-free, so ask the restaurant first. The family that we had it from kill their guinea pigs ‘normally,’ so they have little to no blood left in the meat. Many people have told them that they like the meat much better than some of the other local places to buy a guinea pig. Also, in Ecuador, guinea pigs are referred to as cuy, so keep that in mind when you order. We had a beautiful day with this family and we enjoyed a fantastic meal! I hope you get to try guinea pig some day and that you can bring yourselves to have an open mind about it. I admit I was a bit squeamish the first time I tried it, but it is entirely worth it! Have fun in your travels. Two Roast Cuy Please – Do You Deliver? Before I conclude, I want to share a few shots from cuy we ordered-in. Yup – we called in an order for 2 roast cuy – complete with all the fixings and it was delivered to our house. Want more amazing Ecuador food? See what other amazing dishes are served there. Will you try cuy in Ecuador? Have you tried it? Join me in the comments – and let me know all about it! That was a very well written article. We did not try guinea pig when we were in Ecuador. Maybe we will when we go back. I have tried cuy…hind quarters…off the grill…delicious. No and I don’t think I will ever try it. I have seen it cooking in Ecuador. I couldn’t see myself eating that little cutie. I do not like the cuy very much. Not a fan of the cuy. Escaping the cold of Colorado, I spent last January in Cuenca, Ecuador to have some dental work done. Though having a guinea pig as a pet while growing up, I was determined to at least give cuy a taste before leaving the country. So I invited my Ecuadorian friend, Juan, to take me to a good restaurant that serves cuy. The dinner would be on me. I must admit that the first bite was a bit of a challenge, but from that point on … it was easy! The robust flavor of the meat was deeeee-licious! Back home my friends tell me to stay away from pet stores!! I tried cuy at Mitad del mundo when I was living in Ecuador on a study-abroad term. I didn’t order a whole or even a half, because the price was prohibitively expensive. My tiny piece was mostly bone however the meat on it, what little there was, was very tasty (and yes, there was a paw attached). As it was very close to Oct. 31, my cuy and fixings were followed up by a lovely desert of guagua de pan and colada morada. I got to go the the Middle of the Earth and eat cuy on the same day. A special memory indeed! Yes, I have eaten Cuy in the Andean mountains of Peru, in equador and in Bolivia cooked in different styles and ways. I have enjoyed the variety. People who eat chicken, beef etc for reasons unknown think that it is ghastly to cook guinea pigs. I do respect the local traditions and cultures and no one is forced to eat food that they don’t relish or don’t like. It does taste a bit like rabbit. I’d just as soon eat the family cat. Sorry. I’ve looked, but can’t find cuy on the coast. I live in Salinas, and have looked in Puerto Lopez, Salinas, even Liberdad…I wouldn’t eat an unshelled boiled egg in Montanita or Olon. Two of the filthiest little burgs I have ever seen. I do not want to try to find ‘fresh’, uncooked meat to do at my apartment, so I have not checked out our local mercados. They are more of a Sierran tradition – but I’ve heard that there are a few restaurants that serve them on the coast. Yes, I’ve eaten it twice. To my mind it’s right up there with crawfish and frogs legs–culinarily overrated and waaaayy toooo much work for each tiny bite. And “tastes like chicken.” Give me a sirloin steak any day. I did not try it, or even know about it the first time I was in Ecuador, but will most certainly give it a whack (no pun intended) when I get back. Never have, never will. I’ve also never eaten rat. Great post. Gave me a few things to think about. Now I just need to look up how to ask if the cuy are bloody. No Valerie, cuy are not bloody. If anything, they can be overcooked. Disgusting! I would like to see you instead with a pike through you mouth and behind roasted. Many that will be your fate in the afterlife. How lovely! Do you disagree with the cooking method, the meat choice, or meat in general?